Sajadifar, M., Pourghannad, B. (2011). An Integrated Model for a Two-supplier Supply Chain with Uncertainty in the Supply. Journal of Industrial and Systems Engineering, 5(3), 154-174. Mehdi Sajadifar; Behrooz Pourghannad. "An Integrated Model for a Two-supplier Supply Chain with Uncertainty in the Supply". 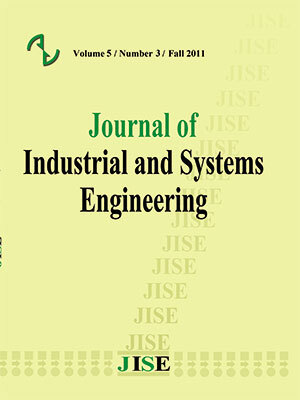 Journal of Industrial and Systems Engineering, 5, 3, 2011, 154-174. Sajadifar, M., Pourghannad, B. (2011). 'An Integrated Model for a Two-supplier Supply Chain with Uncertainty in the Supply', Journal of Industrial and Systems Engineering, 5(3), pp. 154-174. Sajadifar, M., Pourghannad, B. An Integrated Model for a Two-supplier Supply Chain with Uncertainty in the Supply. Journal of Industrial and Systems Engineering, 2011; 5(3): 154-174. The objective of this paper is to study an integrated two-supplier supply chain whose suppliers are unreliable. An unreliable supplier is alternative between available (ON) and unavailable (OFF) states which are considered to be independent exponential variables. The suppliers apply a continuous review policy and the retailer uses an adapted continuous review base on an(R,Q) policy. Transportation times are constant and lead times are non-zero random variables. The retailer faces independent Poisson demands. Using the idea of the one-for-one ordering policy, we implicitly incorporate the distribution function of the random delay for obtaining the value of the expected costs of system. Finally, resorting to a dozen of sample problems, we show that the average cost reduction in our inventory system is at least 3.69% and at most 36.95% comparing to the one with only one supplier. disruptions and partial backorders; Naval Research Logistics 46; 687–703. inventory systems;Operations Research 41(4); 777-785. Gupta D. (1996), The (Q,r) inventory system with an unreliable supplier;INFOR 34; 59–76. system with information sharing;Journal of Industrial and System Engineering, 2(1); 41-50. Journal of Operational Research 95; 53–61. Minner S. (2003), Multiple supplier inventory models in supply chain management: a review. International Journal of Production Economic 81:82; 265-279.
time;Computers & Operations Research 30; 411–426. Journal of Production Economics 87; 25–37. environment;Annals of Operations Research 91; 123–136. supply availability;International Journal of Production Economics 42; 131–136. multiple suppliers;Naval Research Logistics 43; 192–210. interruptions;European Journal of Operational Research 99; 366–385. inventory problem with multiple objectives;Operations Research 48; 243–255. with order splitting and information sharing; IEEE conference 2008.
management: Technologies and Methodologies. Springer. in supply demand; European Journal of Operational Research 59; 370–382.